Radovan Vlatkovic is widely considered to be one of the world's most exceptional horn players. Born in Croatia, he is the former Principal horn of the Berlin Radio Symphony Orchestra (Deutsches Symphonie-Orchester Berlin) which he left to devote himself to an international solo career and teaching. He is professor of horn at the Mozarteum in Salzburg, Austria, at the Escuela Superior de Musica Reina Sofia in Madrid, and honorary member of the Royal Academy of Music in London. Probably the most celebrated living horn player, Radovan Vlatkovic shares a lifelong experience as a horn soloist, teacher and performer with anyone interested in bringing their own horn playing to the next level. Get guided for 2 hours through 22 chapters in a detailed warm up program and to the basics of horn playing. Insights, tips, loads of exercises and background knowledge directly from one of the world’s leading instrumentalists. Intro to the most comprehensive video horn guide ever made. Every brass player knows the importance of buzzing, and Radovan has his own ideas about how he uses buzzing every day. Harmonics is another key element for Radovan's warm up, and he invites you to play along with him, for you to control your pitch and rhythm. Adding the valves slowly to some techni cor exercises gives you more control and flexibility. Building it up slowly is the keyword. Like singers it's a matter of gradually building up the range. Still simple exercises, but as Radovan puts it: " all professionals rely on these easy exercises and they are important throughout any kind of career playing the horn". Adding even more range step by step. For Radovan scales and arpeggios are a fully integrated part of his warm up and for a very good reason. Watch him explain and see for yourself what it adds to your playing. Philip Farkas is a well known name in the horn world and for a good reason. The pre-warm up exercises from the famous " The art of french horn Playing " adds a different approach to the concept of sound. Radovan explains how to develop clean and accurate attacks. Radovan suggests a different approach in order to be able to start a trill fast immediately. A " Control Exercise " by Barry Tuckwell is another efficient espressivo slow-mo way to start warming up.
" The ideal for a beautiful horn sound is the human voice "- but how do we immitate that? The vocalise exercise is a good starting point for this. Radovan has a specific way of ending his warm up program, and that is playing long notes, slowly and easy. Second half of " The Horn Guide " is a set of horn basic exercises that will help you develop range, sound and intonation. Everyone would like to have a beautiful and effortless high range on the horn, but how do you get there? The embouchure is where the instrument merges with the body, and every horn player know how critical this part of the technique is, in order to avoid pain but also in order to have a perfect control of tone, intonation and sound. Many horn players neglect the low range, but Radovan practice low range every day in order to keep his chops on top of the game. A healthy breathing is of course the very fundament for any horn player. There are so many different approaches and ideas about this topic, but Radovan shows what has helped him through his career. Tongue position is crucial for the right tone production and intonation. The tongue is a muscle connected to lots of other muscles and therefor facial movements can be a good indicator if you do things right. Compared to many other instruments the horn doesn't have that much finger movement involved, but still the one it has is important to understand how you can optimize in order to play better and more effeciently. What is the right hand and arm position for the ultimate results? The right hand plays a huge role for a horn player. How to shape it, and how to understand the various techniques and how they influence your playing is what this chapter is about. Brahms 1st symphony has some amazingly beautiful legato solos and shows why a smooth and great legato makes the music worth listening even more intensively to. But how do you play a beautiful legato on the horn? Sound! What a huge topic! What is a good sound? What is a full sound? Which sound is yours? Sound - sound - sound... the true soul of any musician- and maybe why Radovan's playing is so admired and loved. Horn warm up program together with Radovan Vlatkovic. Go through a solid, diverse warm up program that will get you ready for the day. Radovan Vlatkovic (born 1962) is a Croatian born horn player. He is the former principal horn of the Berlin Radio Symphony Orchestra (now Deutsches Symphonie-Orchester Berlin). He left that post in 1990 to devote himself to a solo career and has recorded many of the major works for horn. 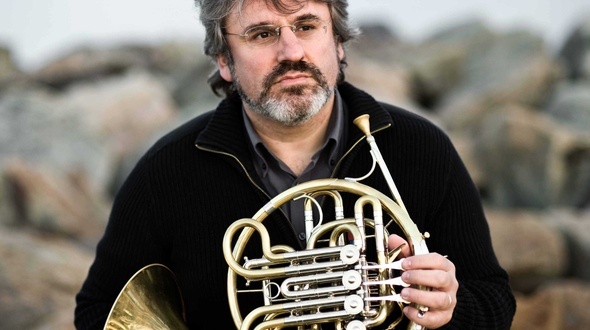 Radovan Vlatkovic is now professor of horn at the Mozarteum in Salzburg, Austria and at the Escuela Superior de Musica Reina Sofia in Madrid. Radovan Vlatkovic teaches Strauss 1st Horn Concerto, 1st and 2nd mvt in masterclass no 2. Learn about Radovans way of natural phrasing, sound production, projection of sound, itonation, plenty of exercises and much more. Radovan Vlatkovic (born 1962) is a Croatian born horn player. He is the former principal horn of the Berlin Radio Symphony Orchestra (now Deutsches Symphonie-Orchester Berlin). He left that post in 1990 to devote himself to a solo career and has recorded many of the major works for horn. Radovan Vlatkovic is now professor of horn at the Mozarteum in Salzburg, Austria and at the Escuela Superior de Musica Reina Sofia in Madrid. Radovan Vlatkovic teaches Gliere´s gorgeous Horn Concerto in masterclass no 2. Learn about Radovan Vlatkovic´s way of natural phrasing, projection of sound, technical tips, practice patterns, and much more. Radovan Vlatkovic (born 1962) is a Croatian born horn player. He is the former principal horn of the Berlin Radio Symphony Orchestra (now Deutsches Symphonie-Orchester Berlin). He left that post in 1990 to devote himself to a solo career and has recorded many of the major works for horn. Radovan Vlatkovic is now professor of horn at the Mozarteum in Salzburg, Austria and at the Escuela Superior de Musica Reina Sofia in Madrid. 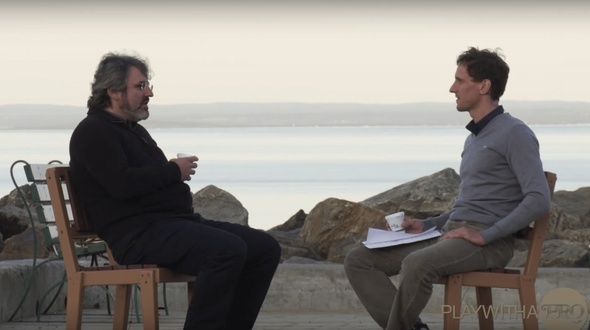 Radovan Vlatkovic talks about how he used to practice as a student, what to focus on in your first professional jobs, how to built a horn section, the difference on being a soloist versus an orchestral player and much more in this interview in the middle of the ocean.... Radovan Vlatkovic (born 1962) is a Croatian born horn player. He is the former principal horn of the Berlin Radio Symphony Orchestra (now Deutsches Symphonie-Orchester Berlin). He left that post in 1990 to devote himself to a solo career and has recorded many of the major works for horn. He is now professor of horn at the Mozarteum in Salzburg, Austria and at the Escuela Superior de Musica Reina Sofia in Madrid. 2 full masterclasses going through Strauss 1st concerto and the Gliere Concerto. The most in depth horn guide available- more than 2 hours solo warm up and horn basics. Warm up in a group guided by Radovan Vlatkovic, as the perfect beginning of the day.